We all knew it would come down to this. The third and final game in the series between the top two teams in the conference takes place Wednesday night at the Aitken Centre in what is sure to be another instant classic. These to teams are so close to each other they could probably play 20 games and still be tied. So far, home ice advantage has been the difference in the series. And that's what the team played for all year long - to secure home ice advantage in the swing game of the championship series. Expect another energetic, jam-packed crowd for this one. There were line-ups at the box office for tickets as early as Monday afternoon, so if you haven't bought your tickets yet, you might want to visit the box office during the day or get to the game early to beat the rush. Game time is 7 PM and of course if you are unable to make it you can listen to it live on CHSR. Win or lose, this is the last game on home ice for UNB this season, and our team captain's last game at the Aitken Centre. 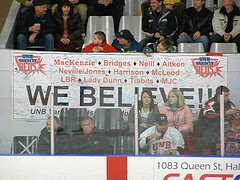 So let's be the "sixth skater" on the ice for our V-Reds and make sure the folks in Thunder Bay know we're coming!!! I got my tickets yesterday.. hopefully the game is packed! Should be a really goood game. You can also watch the game on Rogers Cable 10. I'll set my capture card up and record this game. UNB has only had one series go the distance in the past 5 years - 2006 vs StFX. They won that series: home 7-5, road 3-4 OT1 then won game three 9-3 at home. Prior to this they won a best of 3 series 2-to-1 against STU in 2003 (to far back to have any players in common). The only players left from 2006 are John-Scott D., Dustin F., Rob P.
The Rogers Audio will be a simulcast of CHSR (Dave and Dave).